I done forgot what I was supposed to be friPodding this friDay. Oh well, let’s talk about the newest album I bought that iSaac and I can’t stop pumping through every speaker I can plug him up to. 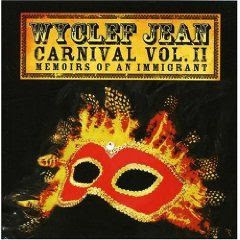 Wyclef Jean’s Carnival, Volume II: Memoirs of an Immigrant. I find it interesting, almost ironic, how I haven’t bought a Wyclef album since The Carnival, which I loved so much that I “borrowed” it from my sister for the past… I don’t know… 10 years? Well, I accidentally stepped on her original copy while I was making a mad dash through a messy room trying to shut off an alarm, so I had to buy another one. She does not know this because that happened maybe 5 years ago. I swore I bought that album a couple times due to similar accidents… but that’s all beside the point. What I like about this album is how similar it is to the first. Guest list galore, and each song seems to come from a different location, or has an influence from a different culture. The original album has that same flare too. However, there are no interludes, which made the first album seem like a movie or something. But that being the first solo album after The Fugees’ The Score, I think it made sense. ‘Twas the time of the interludes. Nowadays, we get our music online or even by the song. Interludes are a thing of the past. So sad. I wanted to be on some interludes. But back to II. This album is actually 2 years old, it came out in 2007. But if I haven’t heard it, it’s new to me, right? And I liked coming into this album not being aware of the singles or what was a big hit. I already know, thanks to iTunes, that the song most popular was Sweetest Girl and it is indoob a good song. I also highly enjoy King & Queen with the Colombian goddess Shakira. I’m thinking about getting a few of her songs because I’m digging her voice these days. Next up is Fast Car with Paul Simon. I liked this song based on the preview alone without even knowing what the song is about. Kinda on the serious and sad side, but still, I love it. Next is What About the Baby with Mary J. Last I saw them together was with 911. I think this is like a continuation of that song, and maybe a hint of Gone Til November. Just me. I won’t talk about every song. There are a few others on here I really liked. And I like the messages in some of these songs… which are about immigrants and/or society. Not really shocking, is it? But honestly, I didn’t love every song. But the most interesting is the last one called Touch Your Button Carnival Jam which has a long guest list. It has to. It’s 13 minutes long! It’s really 3 songs in 1, and feels like a party that’s winding down, but still jamming. I have to imagine that this is what a carnival party is really like. Either way, this album fits nicely with my other Wyclef tracks. I would’ve loved some cameos from the other Fugees members, Pras and Lauryn. Who wouldn’t? ‹ ready to read about writing right: "how to write a movie in 21 days"